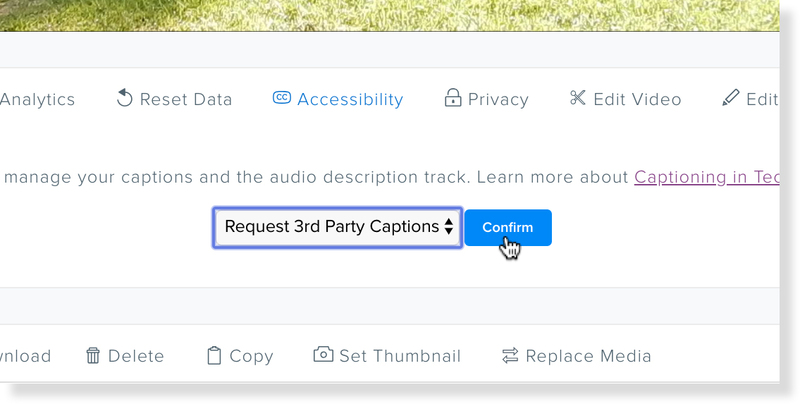 Once the integration has been set up, follow the steps below to request closed captions for your recordings stored on your Relay site. Caption requests can be submitted by the video owner or by users who manage captions (Caption Admins, accessibility assignees, etc.). Each request requires approval from either a Relay Site Admin or a Relay Caption Admin before the request will be sent to 3Play Media. Admins will also need to approve requests they’ve submitted themselves. The closed captions will be sent back to the video automatically upon completion of the transcription process. Navigate to the Media section in My Library within your TechSmith Relay site and click the video that requires closed captions. From the video page, click the Accessibility button located directly below the video. Click Select an Action and from the drop-down menu that appears select Request 3rd Party Captions. Click Confirm once Request 3rd Party Captions has been selected. Remember though that the request will need to be approved by a Relay Site Admin or a Relay Caption Admin for the request to be sent to 3Play Media. Admins will also need to approve requests they’ve submitted themselves. Once a request has been approved you can log in to your 3Play Media account to check the status of the request, upgrade to a faster turnaround time, or cancel the request. Note that either canceling or upgrading the turnaround time will need to be done immediately after the request is approved.